This weekend will be busy. 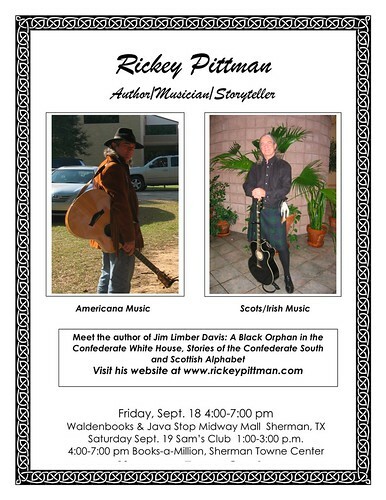 Tonight, I have a presentation for the Sherman, Texas, SCV. Then tomorrow, a signing at Waldenbooks at the mall in Sherman, and an Americana music show at the Java Stop Coffee House beginning at 7:00 p.m. Saturday, I’ll have signings at the Sherman Sam’s Club and the Books A Million. Monday, I’m presenting a program at Region VIII Media & Library Services in Mt. Pleasant, Texas. I’ll then return home Monday night and get ready for the next cycle of author events. Here is a flyer for my weekend. If you’re in the area, come and see me.